The Nightstick NSP-4614B Low Profile Multi-Function Dual-Light™ Headlamp is designed specifically to work on hard hats that have a flip-up face shield. The unique low-profile shape allows the user to work without having to remove the headlamp when raising or lowering their face shield. The NSP-4614B is manufactured from glass-filled nylon polymer and features a multi-position tilt head design making it both tough and versatile. Both the spotlight and the floodlight on the 4614 use CREE® LEDs and an advanced (TIR) Total Internal Reflection set of lenses designed to optimize lumen output and beam pattern. 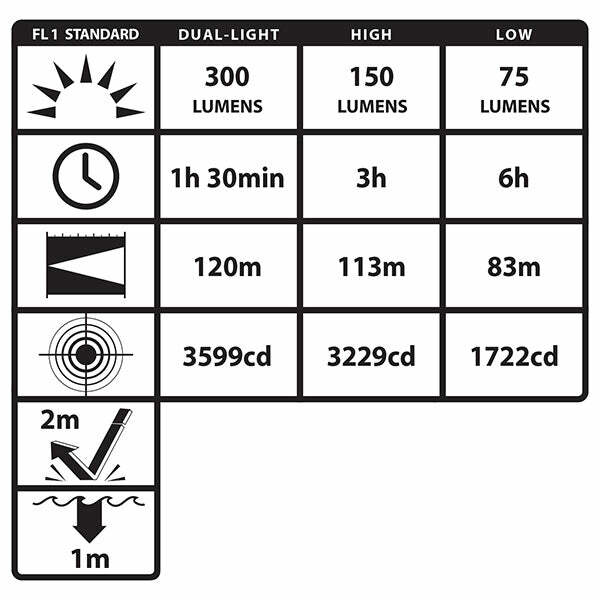 The spotlight and the floodlight are both rated at 150 Lumens in high-brightness mode and 75 Lumens while in low. The front mounted dual switches provide easy access to the spotlight for distance illumination, the floodlight for close-up illumination, and Dual-Light (both the spotlight and the floodlight on simultaneously) for maximum lighting, versatility and user safety. The NSP-4614B includes a heavy-duty rubber head strap for use on a hard hat, as well as, a non-slip elastic head strap for use on a ball cap or directly on the user’s head. Power is supplied from 3 AAA batteries (included).